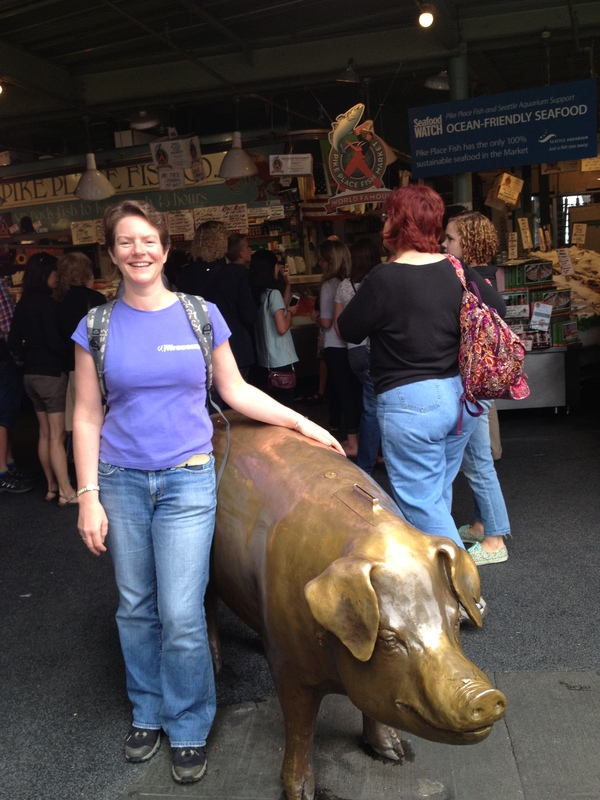 There had been only one tourist sight on my list of places to see in Seattle, which has however been on my list of places I wanted to visit since 2002: Pikes Place Fish Market. The fishmongers at Pikes Place sing chants together, throw the fish to each other rather than carry them to their display positions and engage all customers in their banter. A video was made of their antics and used as a basis for customer service training and also featured in one of my MBA classes. I had always wanted to see whether they were really like that. Now, twelve years after I first saw the video of fish flying across a market stall, I shot this video. 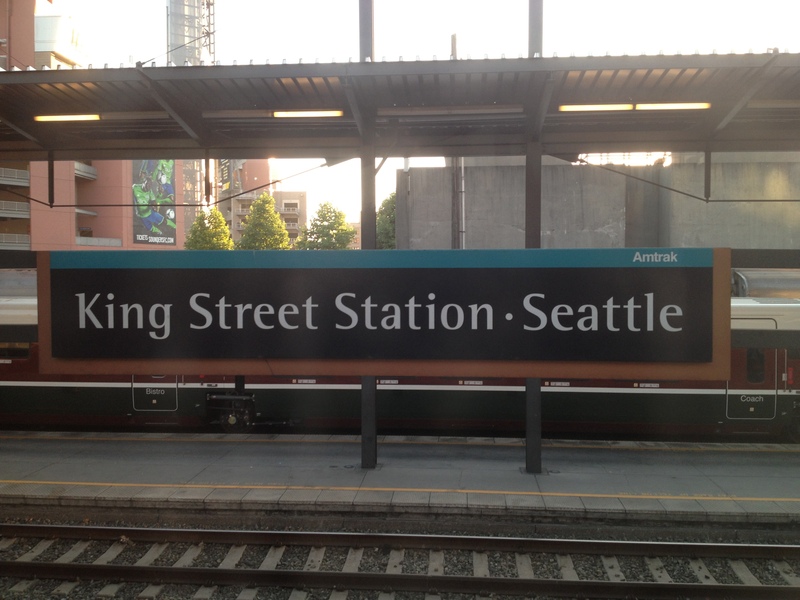 Fortunately, a friend of mine moved to Seattle ten months ago, and he had time to show me around a few more sights of the city as well as taking a picture of me, to confirm that I am actually on these travels and not just finding pictures on the internet and telling tall stories. This is the Market Place Piggy Bank into which visitors can place donations which pay for the upkeep of the old market which houses many more stalls than just Pikes Place. 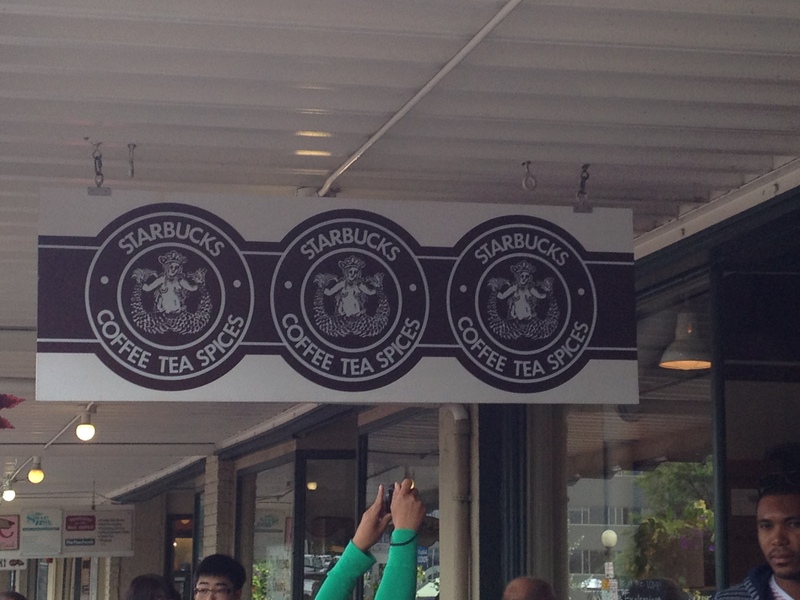 It is also only just down the road from the very first Starbucks to open in 1971. There is always a performer of some kind outside that Starbucks, on Saturday’s often a band rather than the single guitarist on the Monday I came by. Parking around the waterfront near the market is difficult, so we had parked near the Space Needle and taken the monorail through the Experimental Music Project. As well as offering opportunities to experiment with music, it houses a sci-fi exhibition which includes the original set captain’s chair from the first series of Star Trek and Doctor Who paraphernalia. To the disappointment of many of my friends I am sure, we didn’t go inside, so I am not able to write a review. Something to do next time I’m in Seattle. 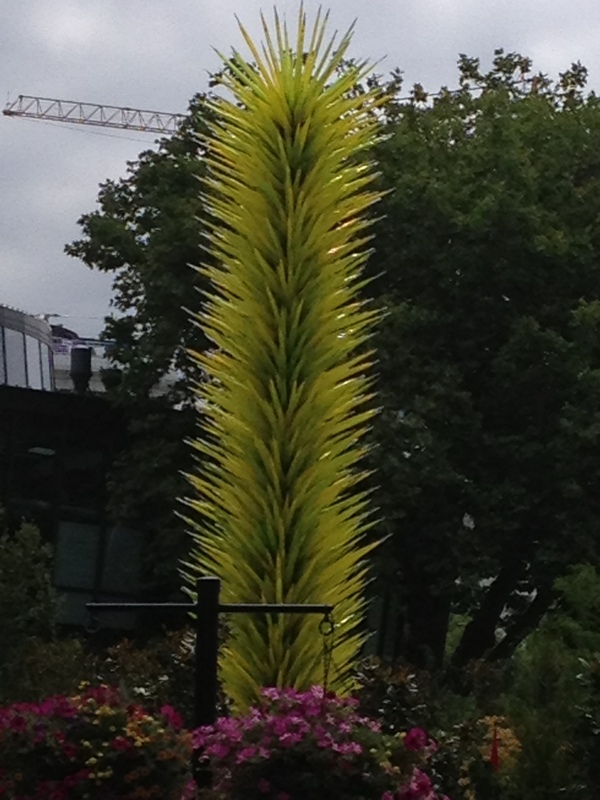 Next to the Space Needle there is a Chihuly exhibition. 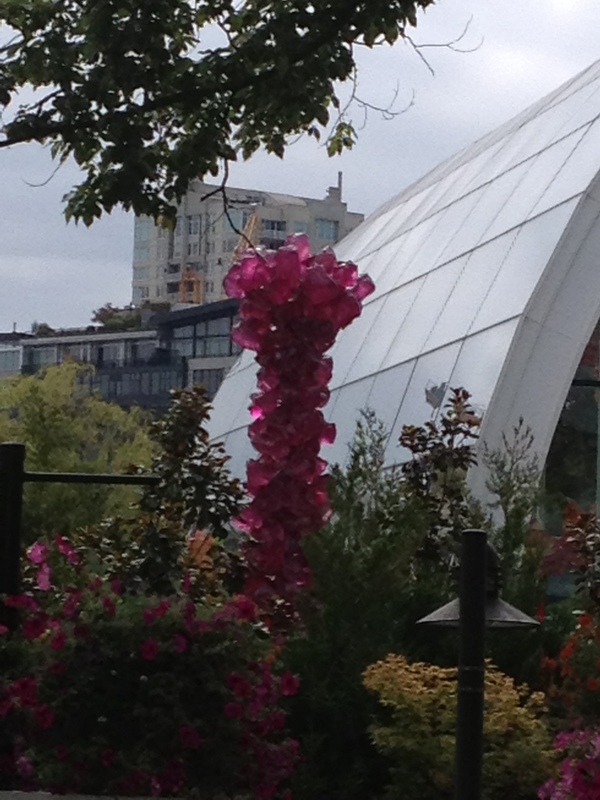 Dale Chihuly is an artist who works with glass. Visiting the full exhibition will also have to wait until my next visit, although the piece peeking over the top of the hedge were impressive and with more time I am sure I would have enjoyed it. 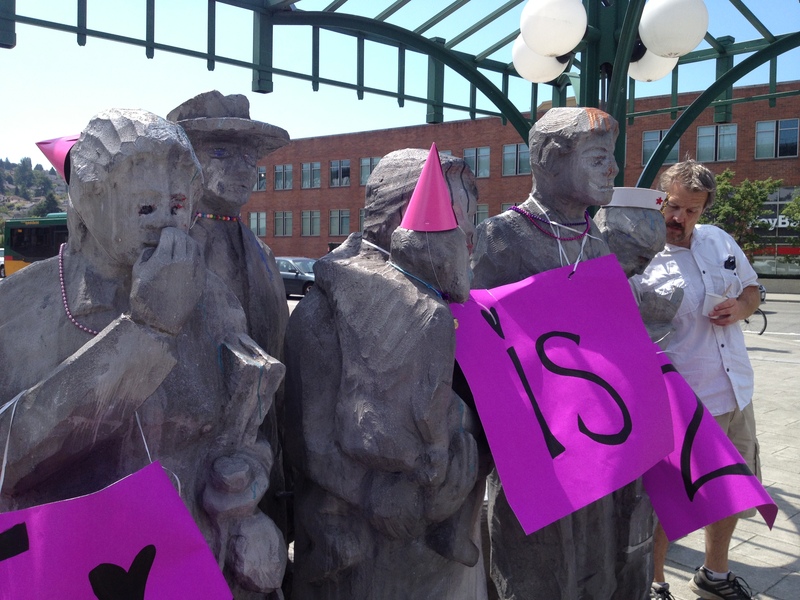 We then went to Fremont, which has a number of interesting and funny public sculptures. 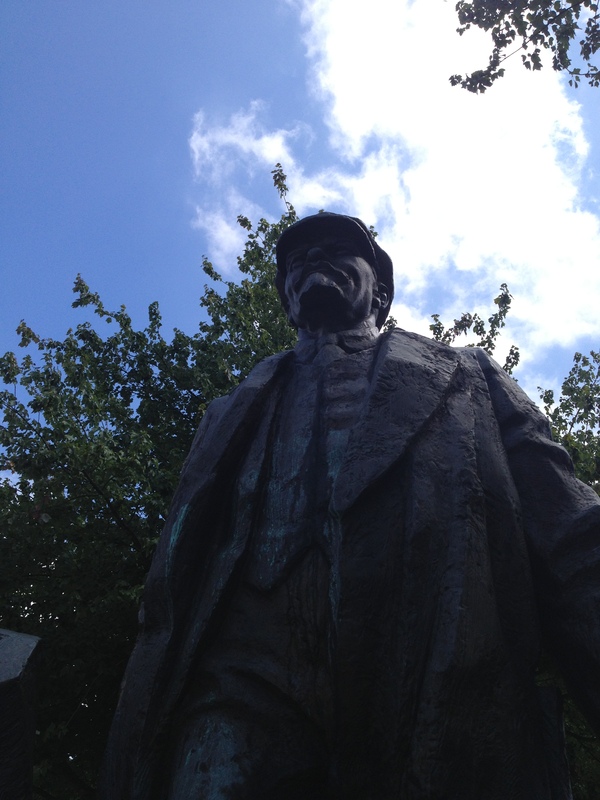 The first one we stopped at is of Lenin. This bronze had been found face down in the mud in Poland by an American who fully understood why the statue had been toppled as the iron curtain had come down, but was also interested in providing continued respect of the artist who had cast the statue. He mortgaged his house to pay for the transport of it 8 ton depiction of a dictator and it is now on display in Fremont, Seattle. The original discoverer has subsequently died and his family owns the statue, which is for sale, guide price around $300,000. 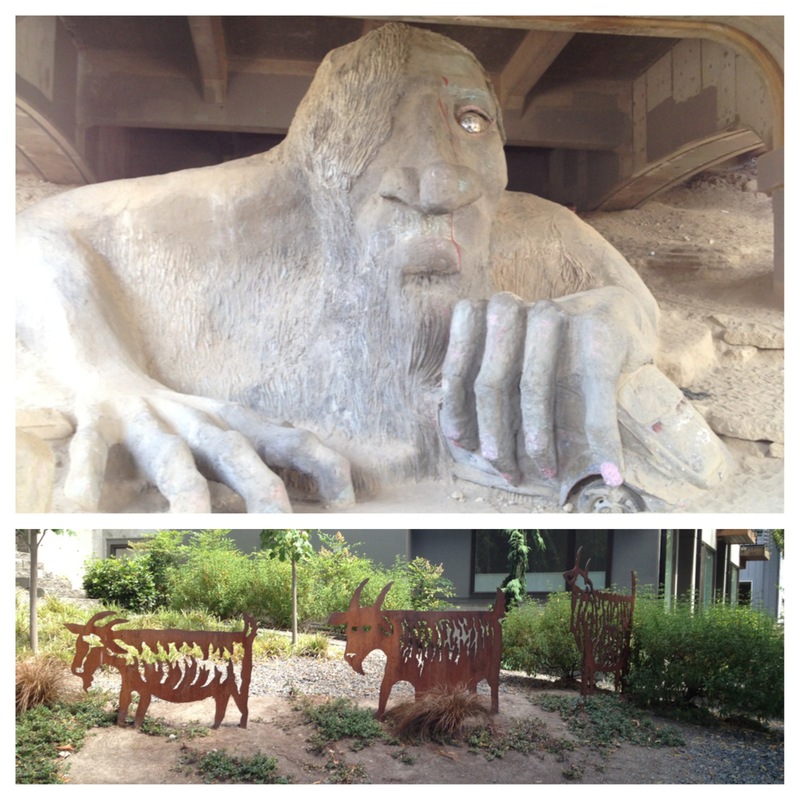 The next place we visited was the troll under the bridge. It is crushing a full size VW beetle in its hand and recently became more famous after British Actor Simon Pegg posted a picture of himself standing on the troll’s hand on Twitter. The whole street has taken to the troll, having been renamed Troll Avenue and the three Billy Goats Gruff standing in a the front gardens further down the road. There is also a fake bus stop on Fremont which a sculpture of people waiting for the bus. These statue people are dressed up by real people for a range of occasions, such as Uncle Sam style hats on 4th July or in Halloween costumes in October. Erin was celebrating her 21st birthday either the day we visited or the day before, the cardboard signs looked relatively new. My friend couldn’t help himself from behaving like any good commuter and started reading over someone else’s shoulder. 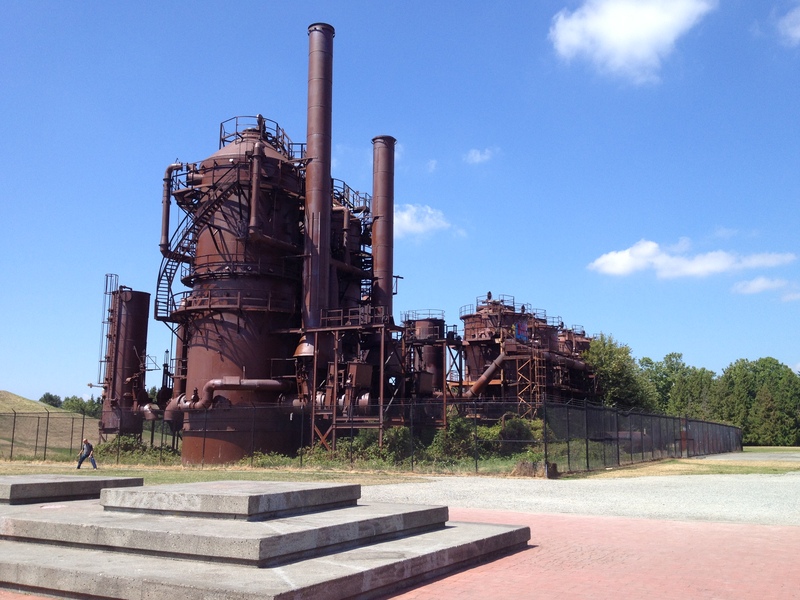 The last place we visited were the Gasworks, now disused and a feature of a park on the Pugent Sound. The machines have been painted colourfully and despite the clear signage that they are not to be climbed on, lots of children were playing in and around the cemented in retired machines. 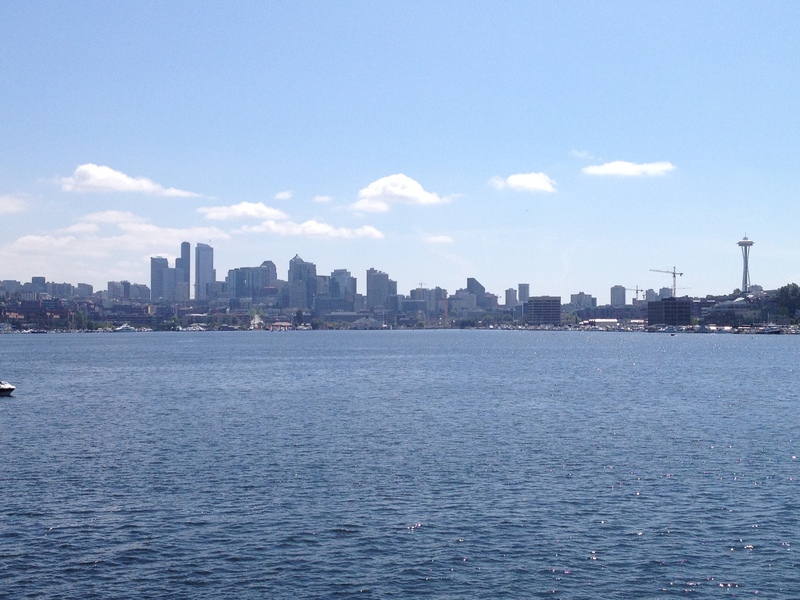 The location is also fantastic for views of the Seattle skyline across the water.